September 2: the first day of school. I hailed the first Lyft Line of the challenge. Although I didn't have a carpool, I had a much clearer understanding of how Line worked. I launched Lyft's app at 7 am, an hour before my 8 am class started. The passenger request screen immediately prompted after (Image 2). As a Lyft rider, this is a familiar screen with the addition of the Line option on the top of the screen. Toggling between Lyft's services: Line (Carpool), Lyft (Lift), and Plus (SUV), the map below gives me live data of available cars around me. In my case, I selected Line. The first step of setting a pickup is entering my destination. [In version 2.5.2], the map zooms out to the city of San Francisco, with my frequent locations, ‘Home’ and ‘Work,’ already pinned on the map (image 3). In my case of commuting to California College of the Arts, it is already pinned as 'Work.' After entering my destination, Lyft gave me an upfront fixed cost of $9 for one person (image 4). By selecting 'Request Line,' the system begins 'matching' my ride (image 5). While waiting, a nifty bit of animation begins scrolling by at the bottom showing people’s profile pictures. After a minute or so, my start point (green pin) and end point (red pin) are connected with a potential route, with a driver on his way to pick me up. Image 6 shows Nic with a Gold Honda Accord who is expected to arrive in 6 mins. By 7:06, I received a text message from Lyft, stating ‘Nic is arriving soon’ and reminded me to wait outside. By 7:09, I was heading to school. I arrived at school by 7:28, I gave Nic a fist bump and thanked him. 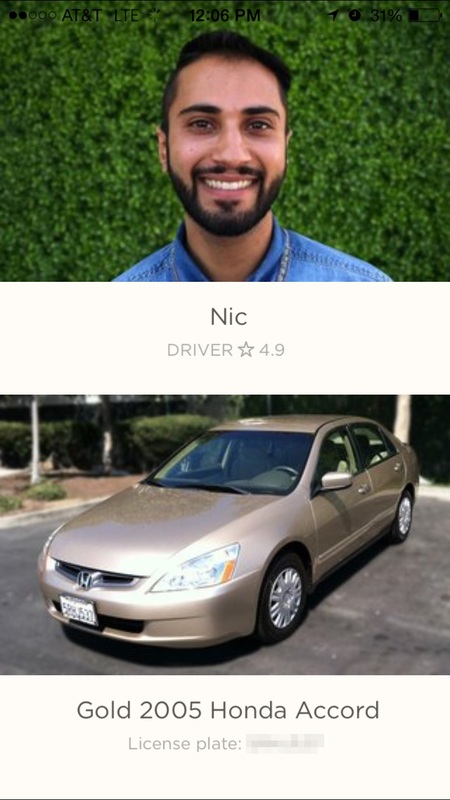 The next thing to show up on the app is a rating of my driver, from 1-5 stars. I gave Nic a five star. Our conversation was fun and he offered me water and mints. I even downloaded an album he recommended. When I checked the time, I was shocked. I had 32 minutes to spare before class. I remember thinking, this was the most stress-free commute I’ve ever had, ever. I could totally get used to it.